All transactions are safe and secure with a reliable history in online purchasing behind each of our associates. 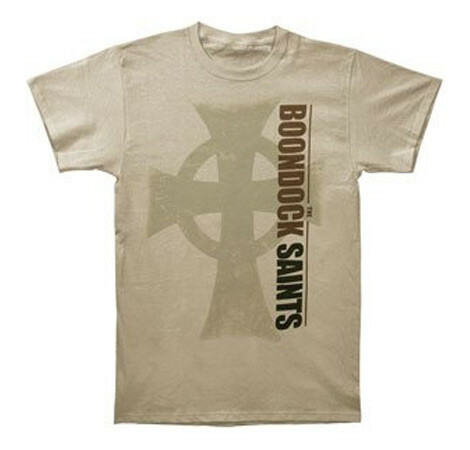 Buy the Boondock Saints Cross t-shirt to own Boondock Saints clothing and merchandise. According to Connor MacManus (Sean Patrick Flanery), bringing rope on a vigilante mission is a good idea. "Charlie Bronson's always got rope. ...He's got a lot of rope strapped around him in the movies, and they always end up using it." Murphy MacManus disagrees, but has no room to talk after Connor discovers his Rambo knife. The image on the front of this T honors the brothers by displaying a Connor and Murphy cross. It's the ideal clothing item to have on when reciting their prayer. This Boondock Saints t-shirt is a cool way to show your love for the movie. The design is perfect to wear with Boondock Saints sweatshirt hoodies. In addition to the Boondock Saints Cross tee above, browse the Boondock Saints Clothing Gallery for more apparel like men's and women's clothes, kids shirts or hoodies.